"The Very Hungry Caterpillar", this foam tiles set isn't only designed to amuse or delight, but to engage children into playful discovery and learning. As they click the different foam tile puzzle pieces to mix and match with others, they become able to discover how the building system works while strengthening hand-eye coordination, basic animal and color recognition, spatial awareness, and exercising imagination. We know that quality and safety also matter, thus, we ensure a successful, and trouble-free playtime experience for you and your child with these Phthalate-Free, BPA-Free, Lead-Free, Latex-Free, and Formaldehyde-Free puzzle pieces that meet and exceed the US standards and regulations. 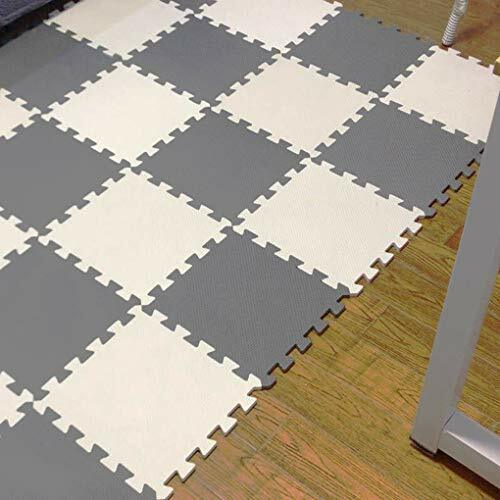 What's more, these foam floor tiles feature a soft, cushioned foam that shields your little one against hard falls so your kid can enjoy crawling, tumbling, or toppling over while feeling safe and comfortable. 18Pcs puzzle mat bright and colorful interlocking foam floor tiles that your child will love to play in with. Each puzzle mat tile has a dimensions of 30" x 30". Each foam tile comes with a middle circualr section that can be interchanged to your child's liking. We Also offer a 100% satisfaction guarantee as we strongly stand by our products. If this product does not 100% satisfy your needs, we will fix it. VIVID COLORS：With It's Interchangeable Pieces, Removable Animal Characters, and Vivid Colors, this Puzzle Play Mat allows Children to Explore and Engage in a Fun, Educational Playtime.